Vainberg’s violin sonatas are not, I suspect, the most known and digested of his large corpus of pieces. Among the chamber music the quartets probably have the most immediate hold on auditors, and they are indeed fascinatingly persuasive examples of his art. It appears however that the Fifth Violin Sonata has never previously been recorded so this makes the appearance of Stefan and Andreas Kirpal’s recording something of a coup. It’s coupled with the Fourth Sonata and the very early Three Pieces, written when the composer was in his mid teens. 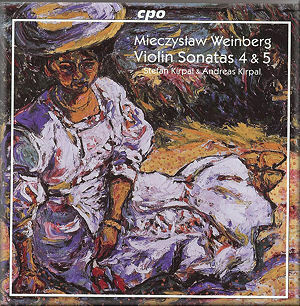 Now that the Kirpals are embarking on a violin and piano series – this is the inaugural volume – perhaps these works will become more part of the bloodstream of appreciation for Vainberg. The Fourth Sonata dates from 1947. It was dedicated to Leonid Kogan, the rising star in the firmament of Soviet violinists but who was still at the time a student, so it’s possible the dedication may have come later. In any case it had to wait until 1968 for its actual premiere. The sonata is in three movements of which the first is by far the longest – in fact it’s much longer than the other two movements combined, which gives the work an unusual topography. It opens with sepulchral polyphony in the piano introduction, before the austerely lyric violin enters. Vainberg takes the violin extremely high in post-Szymanowski fashion. The central movement is an urgent march, vital and exciting, and which prefigures a double stopping cadenza. The finale is meditative, reflective and moonlight-still. The Fifth Sonata was written in 1953 and dedicated to Shostakovich. The four movements are much more conventionally laid out here. The opening has a Miaskovskian, earnest, lyric beauty, whilst the second has moments of easy folkloric influence. The start of the finale ruminates on the earlier lyric themes before embracing an Allegretto – optimistic, alert and buoyant – which soon clouds over and ends quietly, though not pessimistically. It’s high time that the work has been recorded. It may seem less complex and ambiguous than much of his writing but it’s good to be acquainted with its more unbuttoned patina. The Three Pieces are a nocturne, scherzo and ‘Dream about a Doll’ and were written in 1934. He certainly knew how to do crepuscular and the scherzo elements of Perpetuum Mobile Gothic, even at the age of fifteen. The Brothers Kirpal take full advantage of the chances for rich characterisation, as indeed they do throughout this finely recorded recital. It inaugurates a promising series by cannily presenting one pretty much unknown work, with confidence and with authority.